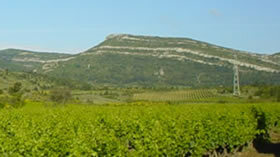 Aric is local dialect for Alaric, King of the Visigoths who gave his name to the mountain whose slopes conceal the Lignères fabulous terroir. The surname of a grandmother, a direct descendant of those Barbarian warriors, was Amalric, and a question still haunts the family today: had Alaric known that his mountain possessed such wonderful wine, would he have plundered Rome in 410 AD? Alcohol 14.5 % by vol.